Wow, this month is flying by! I apologize for the delay in getting Part Two of this series on CNF published, especially since I know it is on the mind of so many of you these days. In the first part of this series we talked about what a CNF is, and when you would need to file one. If you missed it, you can find it here. Today I’m going to talk a little bit about completing the actual filing process. A blog is not a good forum to actually walk through completing a form step by step, so I’m going to answer Frequently Answered Questions in this post. The first thing to know is that there is no fee for filing a CNF with Health Canada. Secondly, when you sit down to file your first one, it’s going to look really confusing; don’t panic, it’s really not that bad. 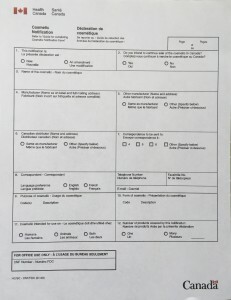 To file a CNF you will need to go to this link for English, http://www.hc-sc.gc.ca/cps-spc/cosmet-person/notification-declaration/index-eng.php, or this link for French, http://www.hc-sc.gc.ca/cps-spc/cosmet-person/notification-declaration/index-fra.php. 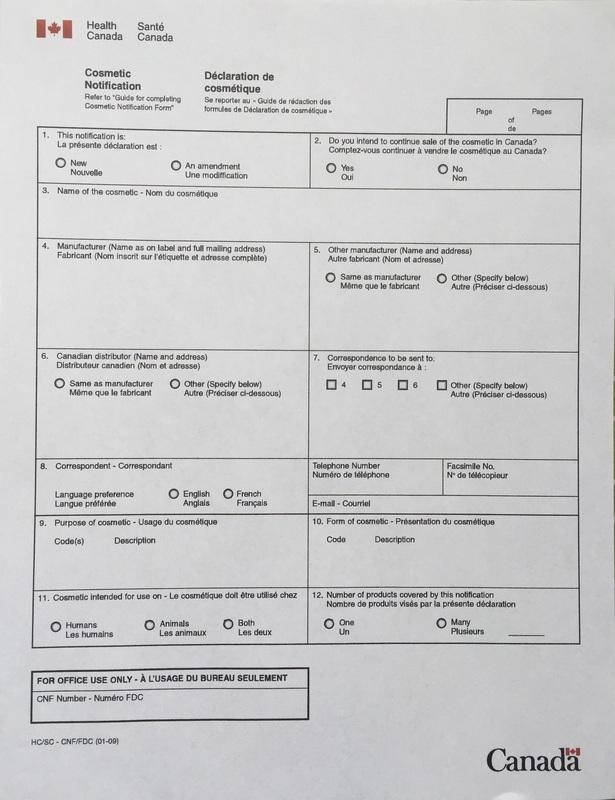 Before you start actually filling out the form, I would suggest that you either print or download into another window the Guide to Filing Cosmetic Notification Forms, which is found here in English, http://www.hc-sc.gc.ca/cps-spc/cosmet-person/notification-declaration/guide-eng.php, and here in French, http://www.hc-sc.gc.ca/cps-spc/cosmet-person/notification-declaration/guide-fra.php. This Guide will walk you through the steps to completing a CNF, and should make the process relatively painless, but if there continues to be confusion surrounding the process, let us know and we can put together a step by step tutorial. 1) Am I the Notifier, the Manufacturer or the Distributor? The answer to this is sometimes you’re all 3! It depends on how you sell your product. If you are making product and selling it directly to the public, you are the Notifier (the company that is filing the form), the Manufacturer (the company that is making the product) and the Distributor (the company that is selling the product). If you are selling product to stores at wholesale prices and they are selling to the public, you are the Notifier and the Manufacturer, and the store(s) would be listed as the Distributor. This also applies if you are making products for Private Label customers. You would have to file 1 CNF for your direct sales to the public, then file a separate CNF for each retailer or Private Label customer that sells your product. 2) What is a Notifier’s Reference and do I have to have one? This is a description you use to identify a product for your own use. If you make Lavender Soap, you might use that description on your website, but for selling you may have an SKU identifier, such as SPLAV or maybe a number that identifies it on your system. You don’t have to enter this on the CNF form unless you want to. 3) Do I have to file a separate CNF for each different fragrance of a product? If the manufacturer, distributor, function, and form of the cosmetic are the same for all the variations of the product, and the base ingredients remain the same, you can file one CNF and add all of the variations in colour, fragrance, or flavour by using the “May Contain” option. If you sell wholesale and/or Private Label as well, you would have to file 1 CNF for your direct sales to the public, and a separate CNF for each store or Private Label customer that sells your product. 4) Do I list the exact percentage of that I use of each ingredient? No. The reason for listing the ingredients is so that Health Canada can confirm you are not using ingredients that are prohibited from use in cosmetics, or if they are permitted but restricted, you are using a safe percentage. They do not need to know what your exact recipe is. If you use 20% shea butter in your lotion, you can use any range that contains your 20%. For instance, LL (Lower Limit, or the minimum that you would use) of 10% and UL (Upper Limit, or the maximum that you would use) of 40%. As long as your recipe stays within the ranges you list for each ingredient, you won’t have to file an amendment if you adjust your recipe slightly because you were short on shea butter and added a little more cocoa butter instead. NOTE: that only applies if all of the ingredients remain the same, and the amount you use falls within the range you have listed on your CNF. You cannot substitute ingredients without filing a new CNF. 5) I only use fragrance oils in my products; how do I fill out the CNF for that? If you make a product where the base is always the same, but you use multiple different fragrance oils, you file one CNF and you list your fragrance oils as “Parfum”. If you make some with fragrance oils and some with essential oils, you can still file one CNF, but use the “May Contain” option to list all of the options, including one for ‘Parfum”, and one for each different essential oil. 6) When I’m listing my ingredients for soap, do I list what goes into the pot, or what comes out of the pot? The definition of ingredients for the purpose of filing a CNF “excludes ingredients consumed during the manufacturing process”. Since lye is used up during the soapmaking process, the proper way to list the ingredients is by using the INCI for the soap that is produced. For instance, saponified olive oil is sodium olivate, saponified coconut oil is sodium cocoate, etc. You can find an INCI listing in the Files of our Facebook group Soapz and Stuffs. NOTE: Although glycerine is created during the soapmaking process, you do not add it to your ingredients. The definition of ingredients for the CNF is “any substance or component that is deliberately added to the formulation.” Glycerine is created during the process, not added. Please note that you DO need to add it to your label. 7) Ok, I’ve got my number now what? Once you’ve filed your CNF, you may receive an email or telephone call asking you to change or clarify some information. If you don’t receive any questions, at some point you will receive an email or letter containing your Cosmetic Number. File it away in a safe place. If you change your recipe, or discontinue selling the product, you will need that number to file an amendment to your CNF. You will also need to have it to show to Health Canada inspectors who may show up at a market where you’re selling, or may find you online. 8) I’ve changed my recipe, now what? Anytime you make a change to your recipe that increases or decreases an ingredient so that it no longer falls within the range listed on the approved CNF, you will need to file an amendment. You will also need to file an amendment if you make an existing product but use a new essential oil. You don’t need to file an amendment to add a new fragrance oil or flavouring, because the generic “parfum” and “flavour” used on your original CNF will still apply. Okay, those are the FAQs that we see most often. If any of these answers are unclear, or you have other questions, please feel free to leave a comment below, and I will answer as quickly as possible. You can also post a question in our Facebook group, as we have many people there who are experienced in filing CNFs and would be happy to help. If you are new to the handcrafted bath and body industry in Canada, you may be wondering what all the fuss is about the Cosmetic Notification Form (CNF). I started to write a short post about CNFs, which quickly turned into an encyclopedia, so I have turned it into a two or three part series. Up first, what is a CNF and why do I need one? Health Canada requires that anyone who sells a cosmetic product in Canada must file a CNF with them within 10 days of first making the product available for sale. Anyone means everyone, from the big name sellers such as L’Oreal or Lush, all the way to your neighbour who sells a few bars to family and friends just to help cover the cost of her raw materials: no exceptions. Aside from reviewing the ingredients in your product to confirm that all of your ingredients are approved for use in cosmetics, the CNF also provides Health Canada with your contact information, which will be used in the event that your product causes an allergic reaction or other issue that is reported to them. They will contact you and ask you to recall the product. Is my product a cosmetic? Health Canada defines a cosmetic as “”Any substance or mixture of substances manufactured, sold or represented for use in cleansing, improving or altering the complexion, skin, hair or teeth, and includes deodorants and perfumes.” This includes bath bombs, bath salts etc. What is not considered a cosmetic? If you make any claims that your product has any therapeutic or healing effect, it is no longer a cosmetic. For example, claims that your dandelion balm treats eczema, or that your tea tree oil mask clears up acne will result in your product being regarded as a drug or Natural Health Product, which requires testing and approval. Some products, such as bug spray or sunscreen are automatically excluded from the cosmetics category even if you make no claims about them. Sunscreen is considered a drug, and bug spray is a pesticide, and they must conform to much stricter regulations. Sale of handmade sunscreen is prohibited in Canada, and sale of handmade bug spray is currently under review. If I file a CNF, can I say that my recipe is approved by Health Canada? No. The only things that are screened by Health Canada when you file a CNF is that the ingredients you are using have been approved for use in cosmetics, and that you are not exceeding the maximum usage rate of any ones that are restricted. What happens if I sell product and don’t file a CNF? That depends on how and where you sell your product. If you are that person who is just selling to family and friends, your chances of getting “caught” are pretty slim. However, there is always the chance that your product may cause an allergic reaction in someone, and it may get reported to Health Canada. Fines for non-compliance range from $1,000 to $25,000 per offence. Now you may think, “my friends would never do that to me”, but imagine if your product caused a reaction in their young child? Or, what happens if your friend buys soap from you and gives it as a gift to someone you don’t know? Still feel confident? It is always better to be in full compliance with all regulations. There is no fee to file a CNF. If you sell your products online, in stores, or at a market, your chances of being found non-compliant are increasing every week. Health Canada has staff reviewing websites and attending markets, and you could find yourself under scrutiny at any time. Okay, I’ve filed my CNF…now what? Once you’ve filed your CNF, one of two things will happen. You may receive an email or phone call from Health Canada indicating a problem with your submission. Respond to their inquiry, and work out the problem. If you aren’t contacted, then at some point you will receive a notice that your CNF has been approved and they will provide you with a number. Keep that number in a safe place. If you ever change the product you will need that number to file an amended CNF. More importantly, this is your proof of compliance which you can show to a Health Canada inspector if one shows up at your market, or contacts you by email requesting to see your CNF. In Part 2 of this series, we will take a closer look at the actual filing process. In the meantime, if you have any questions about the CNF, come join our Facebook group, Soapz and Stuffs and post a question. The group is open to everyone, not just HBBG members, and someone is always around to help. https://hbbg.ca/wp-content/uploads/2016/04/image-2.jpg 2918 2244 Marg Peebles https://hbbg.ca/wp-content/uploads/2016/03/hbbg-logo2.jpg Marg Peebles2016-04-10 12:11:562016-04-10 14:13:30Cosmetic Notification Form (CNF) : Part One.